We walked down the hill with the 30th reunion class. We also saw a famous parent watching his son in the procession. 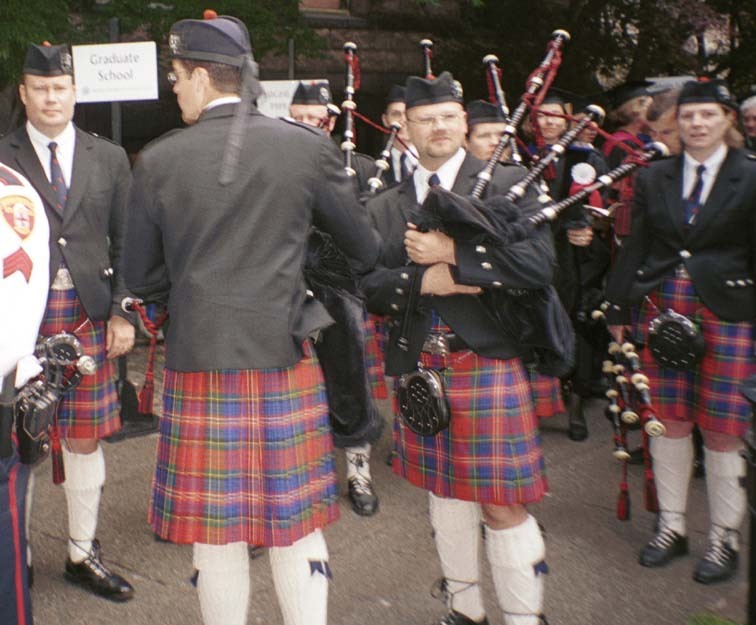 The bagpipes began playing when the graduates descended the hill. The 50th reunion impressed us with their math skills - "19,614 days later". 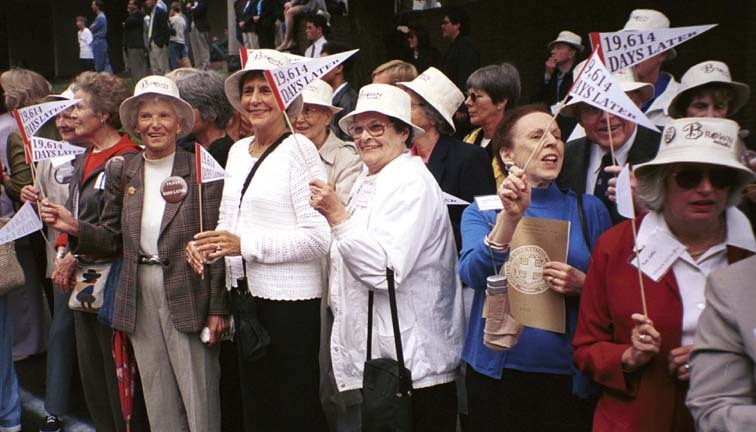 19,614 days before May 28, 2001 was Monday, September 15, 1947, which must have been their first day at Brown as freshmen. 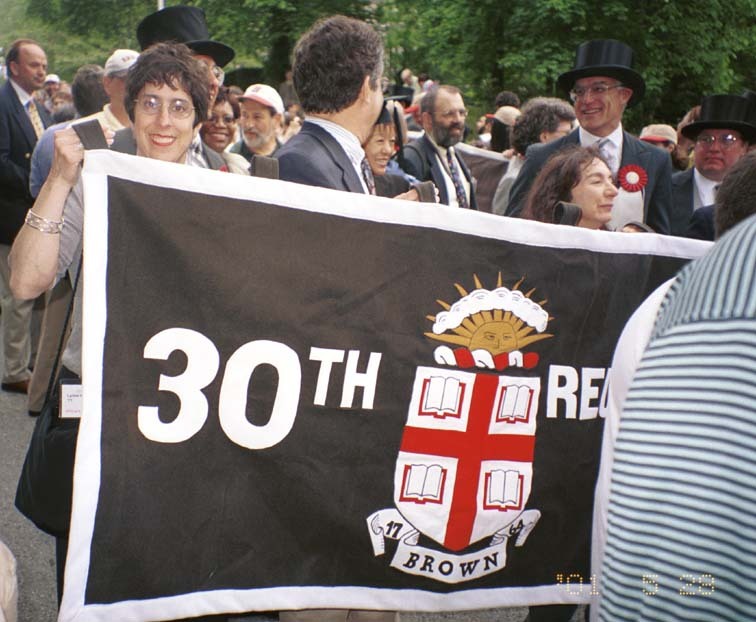 Lynne lent a hand with the 30th Reunion banner. The famous parent across the street and up on the grass was George Harrison, best known by the Class of 1971 from his affiliation with the Beatles . His son Dhani graduated with the Class of 2001. According to CNN, Harrison spent some time in hospital around the time of Brown Graduation. Harrison died of cancer November 30, 2001. CNN.com coverage BBC Obiturary & References R.I.P. This is the same shot as above, but with bodyguards much in evidence. Can't say that I blame him since the murder attempt in 1999. Through the green behind is the parking lot; he was situated for an unimpeded exit if need be. To see the entire image, scroll to the right in your browser.